Acuvue Oasys is a contact lens that offers exceptional health and comfort to its wearers. Vista Eye Care strives to provide our patients with the best in contact lens technology. Any eye doctor can prescribe contact lenses, but our eye doctors take time to research the latest lens technologies and offer the latest and greatest to our patients. Vistakon’s Acuvue Oasys lenses are an excellent 2-week replacement lens that provide exceptional comfort and fantastic health. When our optometrists are discussing the health of a contact lens, we are generally referring to the amount of oxygen that permeates through that lens. Acuvue Oasys lenses allow a huge amount of oxygen through the lens material and are in fact among the healthiest class of contact lenses available, known as silicone hydrogel lenses. Comfort is a primary concern in Colorado, especially with the dry weather and number of outdoor activities our patients pursue. “So often I hear patients complaining about how dry their eyes are,” says Dr. Brian Abert, O.D., FAAO, owner and optometrist of Vista Eye Care. “Many patients have moved here from other states that have more humid climates and they find that contact lens wear in Colorado is more challenging.” Indeed, dry eyes are frequently an issue in contact lens wearers as residents of Brighton, Thornton, Westminster, and Northglenn will all testify. But Oasys is here to help! This lens offers exceptional wetability, comfort, and clarity of vision. The lenses feature Acuvue’s own Hydraclear Plus technology which keeps the lenses moisturized throughout the day. The difference is a lens that is comfortable and capable of holding up to a dry climate -perfect for all our bikers, runners, hikers, and sports enthusiasts. 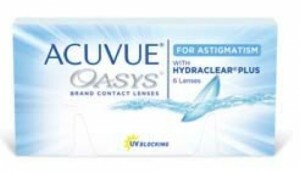 Acuvue Oasys is also available to correct astigmatism. Oasys is a great lens, but what makes it even better is that it is available in a wide variety of powers to correct for astigmatism. Acuvue’s lens stabilization technology (known as Blink Stabilization) keeps the toric lens properly oriented in the patient’s own eye without the discomfort and poor reliability of older, “anchored” or “weighted” toric designs. Oasys is also excellent for children and adults that like spending time outdoors because these lenses block ultraviolet light. Ultraviolet light is responsible for unwanted changes to the eye including early onset of cataracts and age-related macular degeneration later in life. These eye diseases are thought to be largely avoidable if the ultraviolet portion of the spectrum is kept away from the sensitive interior of the eye. Acuvue Oasys provides great comfort, fantastic vision, and exceptional protection of the eye from harmful ultraviolet radiation. Talk to Dr. Abert and Dr. Pedroza today about these great contact lenses at your yearly comprehensive eye and vision examination!